My spring watercolor workshops have begun, and I just taught Part 1 of "Negative Painting can be a Positive Experience." It was a great group of students and we really enjoyed being in the classroom at the Willits Center for the Arts. This Saturday, April 6, I am teaching "Take Flight with Watercolor," a bird painting workshop. This class is sponsored by the Mendocino Art Association, and is full. We will learn how to sketch birds, and use watercolor, ink, watercolor pencils, and Prismacolor pencils to create life- like bird paintings. Watercolor classes for Spring 2019 continue at Mendocino College in Willits. Classes are 2:00-4:50, M & W. It is a combined level class: Beg.-Inter. Classes for fall begin August 19 in Willits. To sign up: More info. : 707 459-6224. I am teaching watercolor workshops this spring and summer. 9:30-4:30 EACH DAY WCA Classroom, Willits TAKE PARTS 1 & 2 TOGETHER, 10% DISCOUNT: $300 FOR BOTH WEEKENDS! Sketching & Painting Birds in Watercolor, held at the Ukiah Garden Club. Homeschoolers. Saturday, August 3- $84. *FIFTH ANNUAL KIDS ART CAMP! $180 for the week. Includes all materials and a healthy snack. *ADULT ART CAMP! First time offered! New things to try each day! $180 for the week. Includes all materials and snacks. *Please sign up early. Class sizes are limited. A deposit of $50 will hold your place. Hot tea, coffee, a juice/herbal tea, and snacks provided. FOR COMPLETE CLASS DESCRIPTIONS PLEASE LOOK UNDER "CLASSES "HEADING ABOVE. PLEASE EMAIL ME IF YOU HAVE QUESTIONS, OR TO SIGN UP. 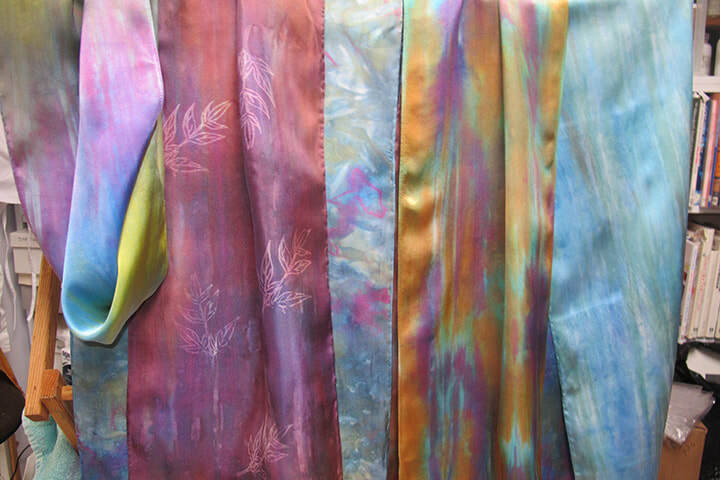 You can find my hand dyed silk scarves, artwork & cards locally, in Willits and Ukiah. I am happy that Linda at Cat's Meow in Willits, & the Willits Art Center carry my scarves, and also the Grace Hudson Museum Gift shop in Ukiah. Three black scarves with shades of lilac, black and green. 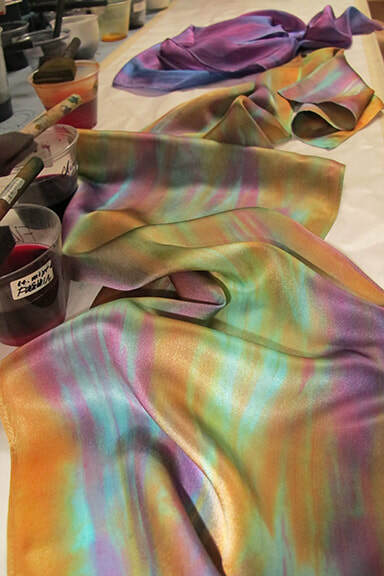 Three variegated color silk & satin Devore' scarves. "Art is my life. It is what gets me up in the morning and what I think about before I go to bed. I could spend all my days painting and creating. Our beautiful countryside in Mendocino County constantly inspires me. As I stop and look around me, I think: Can I capture that sunlit glow, or paint a tree with those dramatic long shadows? Can I express with paint the softness of the fog that rests in the valleys below our home each morning?" I received my B.A. in Art, with an emphasis in painting, from San Jose State University. I have studied watercolor and fabric design for many years at Mendocino College and the Mendocino Art Center. I was awarded Best of Show for my painting entered in the Second Annual Animal Exhibition at the Mendocino Art Center, and I have received several awards for my paintings exhibited at the yearly WASCO Aqua Areas juried Watercolor Exhibition. For over twenty years I have taught art in all the schools in the Willits area, and eight years at Mendocino College. In 2009 I was honored as the Mendocino County Art Champion in the category of Artist. Each year, this honor is given to an artist who demonstrates artistic excellence in their chosen discipline, and shows a commitment to strengthening their community by using their artistic accomplishments to benefit the wider community. I am currently teaching watercolor classes at Mendocino College. If you are interested in classes please click on "classes" above for more information.